» What is the Difference between Microdermabrasion and Chemical Peel? What is the Difference between Microdermabrasion and Chemical Peel? I’m pretty sure you’ve heard about microdermabrasion and chemical peel. Together, these treatments have been making names in terms of skin rejuvenation and getting rid of acne scars. However, before you undergo any of these treatments, you need to know first what the difference is between microdermabrasion and chemical peel to know better which suits you. Read on as we compare the two below. Since microdermabrasion and chemical peel are almost similar as both are used to treat skin conditions including acne scars, acne, wrinkles, sun damages skin, and age spots, probably the biggest difference between microdermabrasion and chemical peel is the amount of exfoliation it does to one’s skin. Both treatments remove dead skin layers to help change and rejuvenate skin. However, microdermabrasion is the least invasive and gentle method while a chemical peel is a little aggressive when it comes to removing dead layers of the skin. 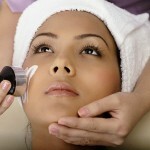 Microdermabrasion (not to be confused with dermabrasion) uses tiny crystals to scrub damaged skin surface. There is actually a microdermarasion kit which a person can use at home, however clinics, they use a pressurized machine to do this method which gently sands away dead skin with tiny crystals. Actually, this can be an option for treatment when trying to fix milder problems. On the other hand, chemical peel actually comes in many types including – Glycolic peel, TCA peel, and Phenol Peel. This method uses mixtures of chemicals to forcefully exfoliate skin. Depending on the range of chemical peel, it gives the patient a “sunburn” reaction. With the chemical mixtures, the skin causes to blister to let out a more youthful skin. This is a little extensive so expect it be done to patients with deeper acne scars or wrinkles. Since microderabrasion is relatively a milder process, patients can recover after a few days from the mild irritation. Redness, swelling, and irritation are just some of the side effects as a result of the method. As for chemical peel, it takes a few weeks or even months for the patient to recover from the blister and peel. Extreme redness of the skin may be experienced as well as sensitivity to the sun. Apparently, the price of microdermabrasion is relatively cheaper compared to chemical peel prices since chemical peels require intensive methods when carried out. Some dermatologists utilize chemical peels together with microdermabrasion depending on individual needs. If you want to know more about these skin refining processes, then consult a highly reputable dermatologist to take care of your skin well.